Other Press (NY), 9781590516966, 192pp. All Days Are Nightis the story of Gillian, a successful and beautiful TV host, content with her marriage to Matthias, even if she feels restless at times. One night following an argument, the couple has a terrible car accident: Matthias, who is drunk, hits a deer on the wet road and dies in the crash. Gillian wakes up in the hospital completely disfigured. Only slowly, after many twists and turns, does she put her life back together, and reconnects with a love interest of the past who becomes a possible future or so it seems. In Stamm's unadorned and haunting style, this new novel forcefully tells the story of a woman who loses her life but must stay alive all the same. How she works everything out in the end is at once surprising and incredibly rewarding. 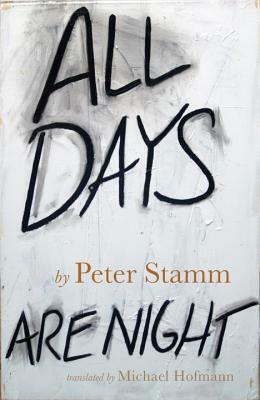 Peter Stamm is the author of the novels Seven Years, On a Day Like This, and Unformed Landscape, and the short-story collections We re Flying and In Strange Gardens and Other Stories. His prize-winning books have been translated into more than thirty languages. For his entire body of work and his accomplishments in fiction, he was short-listed for the Man Booker International Prize in 2013, and in 2014 he won the prestigious Friedrich Holderlin Prize. He lives in Switzerland. Michael Hofmann has translated the work of Gottfried Benn, Hans Fallada, Franz Kafka, Joseph Roth, and many others. In 2012, he was awarded the Thornton Wilder Prize for Translation by the American Academy of Arts and Letters. His Selected Poems was published in 2009, and Where Have You Been? Selected Essays in 2014. He lives in Florida and London."